This interview was carried out in May 2016 while Yolande Bouka was in Namibia. I have been here since December 2015 on a Fulbright on women combatants of the People’s Liberation Army of Namibia during the Liberation Struggle. My husband works for an organization based in Toronto and they've asked to move there. I’ve been dragging my feet, but now we are moving there. I grew up in Canada, so my parents are happy. My parents and I emigrated from France, where I was born, to Canada in 1984 but they are from Togo. I left Canada in 2000 for the US where I did my undergraduate, graduate and PhD studies. I haven’t lived in Canada in 16 years, so it will be interesting. What are you going to do in Canada? I am considering looking for an academic position that allows me to be involved in actionable policy. As I study conflict and political violence, I don’t find it useful to simply theorize about war without figuring out how they have an impact on the people who experience conflict or engage in it. I am looking for either a tenured track position in a university that is policy-friendly and focused on their work having a true impact on the world, or I could remain attached to a university through a fellowship or an affiliation while continuing mostly policy work. Why are you so interested in the impact that conflict has on humans? After a decade researching issues of peace and conflict, I still struggle with the continued reality of warfare and the impact that it has on people. When the Rwanda genocide happened in 1994, we had a family friend whose son, a friend of mine, was from Rwanda. Living in Montreal in the 1990s, we were part of a small, close-knit African immigrant community. Whether you were from Togo, from Rwanda, from Cameroon or from the DRC, you were part of this community. We went to each other’s events. When the Rwandan genocide happened, we were concerned about our friends’ families or friends who had gone back to Rwanda and the region. I was very young at the time, but the genocide stayed with me. It’s probably one of the reasons why I studied violence in Rwanda during my doctoral studies. From a young age I’ve followed the news on a regular basis. My dad wanted us to watch the news every evening. I was a young girl when I saw the Berlin Wall fall! I watched it live on television! A few months later, Nelson Mandela was released from prison. My father wanted me to understand that we were in exile because he was a political opponent and his life was threatened in Togo. He wanted my siblings and me to understand that it was a privilege to be in a country like Canada. He also wanted us to remember where we came from, and that while we were lucky to be in a place where we had the free to do as we pleased, our entire family was still in Togo. My father was an active member of the opposition and while he left Togo to pursue his education, he was certain he would quickly make his way back. As persecution against opposition members intensified, he and my mother decided that it was not safe to return. We stayed in Canada, but for our family, the ties to home were never severed. Whenever I study political violence, particularly in sub-Saharan Africa, I remember I was one person’s decision removed from experiencing the challenges of some of my research respondents. You are real child of the world, having lived in France, Canada and the US. How has it affected you? When you meet new people, they usually want to know where you are from so that they can get a frame of reference in how to speak and interact with you. I have a really hard time explaining that to people. All the places where I’ve lived for a significant number of years (Canada, the US, Kenya), have had a tremendous impact on me. They impact how I see the world, how I interact with other people. I make links between places and time with regards to politics. I find it very interesting for instance that people often talk about western feminism and “African traditional feminism” or traditional values with regard to women. Cultures are indeed different and the politics of feminism are complex. However, I like to remind people that Western feminism is relatively new. Not too long ago, women were not allowed to vote in North America or Europe. They were considered property of their husbands. They weren’t encouraged to work. They weren’t encouraged to go outside of their homes. Some of those values were brought from Europe to Africa during the colonial era. I am not suggesting that all pre-colonial African societies were hallmarks of women’s rights. But we need to nuance the dichotomous discussions about gender and feminism. This opportunity that I’ve had to live and work in different places helps me see linkages that are not always apparent to others. My children are very lucky to have had the experience to travel along with us and to understand that people are people no matter where they are from. Do you worry about all the travelling impacting your kids? Personally, I went to five different elementary schools, so I think children are resilient. That being said, at this point in our lives, I’m a little bit more concerned about providing stability for my son who is six and starting the school system. I don't want to disrupt the school year. My husband is from Côte d’Ivoire but he moved to the US when he was 13. We really feel like we give the best to our children by exposing them to the beauty of everything that is out there, which includes different countries, different people, different cultures, different foods. Our children are twice removed from where we were originally from. It becomes sometimes very difficult to link them to our home countries. If we can’t do it specifically in Togo or in Côte d’Ivoire, we want them to feel a part of the diaspora. Even as we relocate to Toronto, my husband and I know that as we travel for work or for leisure, Africa (yes, I’m speaking about the continent broadly) remains home. I think ultimately, stability is what we make within our family, but for us it’s crucial that our children feel like there are no limits to where they can go, and this is in itself a privilege. It is strange to think that my nephew in Lomé with a Togolese passport can’t just hop on a plane for a visit. But my children can easily make their way there. Sadly, the difference between them is in the passports they respectively have. If my children have this opportunity to travel and to see the world and to feel like there is a connection between other people and themselves regardless of the artificial boundaries that we’ve created, then they will be better people. At least that is what we hope. You did you undergrad, graduate and PhD degrees in the US. Why not study in multiple countries? I went wherever the opportunities were. I finished my undergraduate and I thought that I’d be going back to Montreal. I tried. It’s not for a lack of trying. I also believe that there are also sometimes forces that are greater than ourselves. For my Masters,I applied to McGill University, which is right next to where I went to high school. They lost parts of my application three times! At one point one of my friends dropped off the application so that they had it in hand and they still managed to lose it. As time was running out, I applied to a school that kept sending me pamphlets about applying to their new school of diplomacy and international relations in New Jersey. I got in. Two weeks after I started, I got a letter from McGill saying, “You’re into the program” but at that point, I had already moved. In my life, I have a plan A, a plan B, a plan C and a plan D and then sometimes life happens. That is how I ended up staying in the States… Then I got married and I applied to a doctoral program where my husband, then fiancé, was working and it worked out. You said you got a plan A, plan B, plan C. How do you define each? I go for what I want most. Plan A is always what I want most. Plan B is what I’d like but I’m afraid to go after because sometimes I feel I may not be qualified enough. We all have insecurities about our skills or about what we have to offer but I like to plan for that as well. Unless you go for your dreams and aspirations you are never going to get them. You really have to gun for them. Plan C is a safety net. Do you have a plan in terms of academic career? Academia has gone through tremendous changes in the past decade. While I was trained as an academic to aspire for a tenure-track position at a university, I find a lot of flaws in the system, in how people evaluate your contribution to the field. Furthermore, there is a limited number of jobs. People will do whatever they need to get on top, but what has to be done is not necessarily my priority. Do you think you have more issues as a black woman than you would if you were a white man for instance? I’m not sure how to answer that because the challenges of people of colour in academia, the difficulties for them to be visible, to be recognized for the work that they do and to be treated equally, is documented. I’ve been teaching for many years and I can see in the eyes of some of my students sometimes the first time I walk into a class, “Who is this person and how can she possibly teach me anything?” At the same time, I don't want to discount the advantage that I have from being a black woman, an African woman. Not everyone will see it that way, but it’s a question of perspective. Living and working in various African countries, even if not my own, has been rejuvenating to me. And I was able to access many rewarding personal and professional opportunities. That being said, I’m not sure how well these experiences will be received when I go back on the job market in the West. I’m not sure if I’ll encounter obstacles because of my gender or my race or also because as an academic I’ve done a lot of work in policy, and that is often frowned upon in the academia. I think it’s the purity of social sciences, some people prefer to be detached from the field. Seeing academics and policy experts work on issues of security sit together around the same table and have discussions is relatively new. There are some spaces where that is promoted, but for the most part there is a very specific way in which an academic paper is published that is completely different from the policy papers. As an academic, I get frustrated by the way policy research works. Sometimes, people push you to draw conclusions on immediate raw data because donors are looking for something in particular and because you have limited time and money to produce a policy report. I push against that because of my training. Merging my academic training and my policy experience makes me a better researcher. It makes me a better academic and a better policy analyst because I’m willing to engage in both. It’s very difficult because I have to keep a foot in academia, which means I have to push for publications in a particular way and it’s not remunerated unless I am a faculty member at a university. On the other side, I have the very fast-paced environment of policy work. That world changes based on what is happening on the ground. If you are committed and dedicated to doing both, you really have to function at two different speeds constantly. 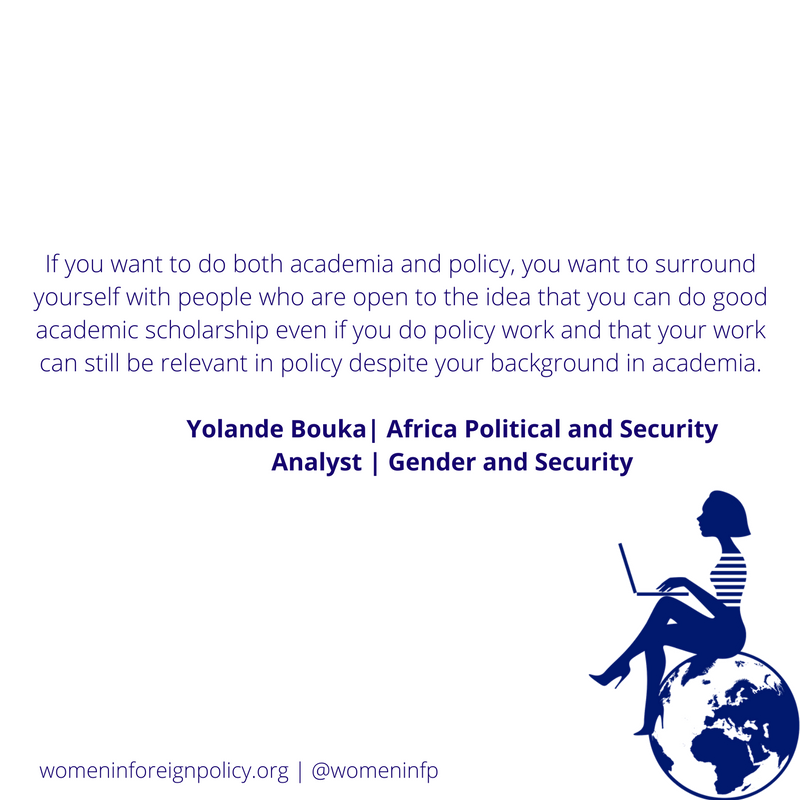 What would be your advice to a young girl who would like to merge academia and policy? Get good mentors! I have many people that I’ve looked up to, who give me advice and are very generous with their time in helping me guide the trajectory of my career. They are doing it because they understand that there is a need for good mentorship and advice for the generation to come. If you want to do both academia and policy, you want to surround yourself with people who are open to the idea that you can do good academic scholarship even if you do policy work and that your work can still be relevant in policy despite your background in academia. Once you surround yourself with people like that, then you have good sounding boards. Then, you need to make sure that you stay on both tracks. That is the most difficult part that I was telling you a few minutes earlier, you have to remain engaged on both sides, to find the linkages between what you do in policy and what can be done in academia. How does your policy work fill a gap that may also exist in the academic literature and how do your academic insights inform this policy work? You have to go to academic conferences but you also have to network with the world of policy, stay apprised with what is going on and be very generous of your time yourself. In both worlds, if you are willing to lend a hand, people will remember. At the same time, you can’t do that at the detriment of your time. That is something that I’ve learned over the years that there is a very gendered aspect of how women work. They volunteer a lot and they do a lot of things that are not recognized because somebody else will take the credit for it. You have to take ownership of your work. It can be very difficult, particularly when you work collaboratively with other people in academia or policy. People want to take credit, to take ownership of your work and sometimes it can sabotage your career trajectory if you are not willing and able to say, “No, this is mine. I’ve done it. It doesn’t matter how junior I am but this is my contribution.” You have to be careful about how you claim that ownership because if you are too aggressive or you are too combative, people will say, “She’s a woman, she’s being emotional.” You have to be consistent and very strategic in how you claim your work and how you market yourself so that people understand that, "yes, it’s collaborative work but this analysis is mine". It started with my hD work. My dissertation was on transitional justice in Rwanda. I worked with released prisoners of the genocide, people who at one point or another had been accused of genocide crimes and then were reintegrated into their community. I was trying to understand how the transitional justice system impacted the kind of people they became after their release, and whether their conception of justice, truth and reconciliation matched the national discourse on truth and reconciliation and the history of political violence in Rwanda. Now, when you look at a lot of work that deals with Rwanda and the genocide, people will usually look at Rwanda experts. And that makes sense. Rwanda is a difficult country to understand. However, I wanted my PhD committee to be composed of people with sets of expertise that fall outside of just geographical expertise. I took a chair who is an anthropologist and who specializes in youth and conflict in Sierra Leone. The other two members were a human rights lawyer and a political geographer with expertise on organized violence. All three were women. I chose my committee members because of their expertise and the relationship I developed with them over time. My Chair is a tremendous scholar. She feels that her work has more relevance when it has impact on the people she studies. That’s how our mentor/mentee relationship started. Since then, I’ve loved seeing how other men and women have reached where they are today. I may not always agree with how things are done in the academic world, but a part of me will always be a scholar. I’m seeking knowledge and understanding. When people feel you are good at what you do and open to new ideas and new frameworks, they are also more drawn to helping you. I have to say that I have been very lucky to find on my path people who are open both in policy and in academia to provide mentorship when needed. You referred to “the committee” but I’m really not familiar with how PhDs work. What is it? In North America, when you develop your dissertation research proposal for your dissertation, you get to select the members of the committee who will be mentoring you and who will eventually approve your actual dissertation. Each university has its own rules on how to select your committee members, but usually you have a chair, the person who is responsible for overall mentorship and guidance. You have additional committee members that can be from your university or from other universities across a variety of disciplines. If they accept to be on your committee, then they are also responsible for reading your chapters as you write them, to provide feedback and guidance, whether it’s on their field of expertise or whether it’s on methodology issues. They follow you through the entire process. At the end, they sit in on your dissertation defence and make sure that your dissertation is worthy of the degree that you will be receiving later on. What is the most important thing you've learned? Flexibility. I have a type A personality. I’m not sure if it’s a personality trait that I was born with or if I developed it. Growing up, I would come back home with my report card and be told to work harder. Once I got a 97% on a math exam. My mum looked at me and said, “I don't understand. You got 97, which is almost perfection, but where did the 3% go?” This is the family in which I grew up. Sometimes I would get really upset. Unless I brought home perfection, my mother was never satisfied. But today I am very grateful to her for always believing that I could do better, because most of the time I could. That part of my personality often means that I have a goal, I have an objective, I trace a path that I'm going to take, and if all goes well I'm going to achieve my goal. That is what you usually want. Since I started my doctoral degrees, as I moved into the policy world, I learnt that being type A is great as long as it doesn’t get in the way of you looking at other options. Being type A can be productive as long as you remain to new opportunities and new ideas. Learning flexibility through a big number of failures on the path to where I am today and on the path to where I’m trying to go has taught me that there is no single way to get to a particular objective. When you carefully assess your options, when you feel like you've reached a dead end, once you carefully assess those options, you may realize that the goal you were aiming for is not necessarily the one that is best for you. Had I not been willing to be flexible, I would have been very frustrated because there were a lot of failures on the way to success. That is something that people don’t often talk about. We usually want to portray an image of strength; one that says, “I’ve got my things together.” The reality is that I fail much more often than succeed. It can be draining. However the few successes that you have end up overshadowing all the failures. Developing a good dose of flexibility along with the drive to succeed makes it easier to keep going. Life is a marathon and this formula allows me to keep running even when I or when I feel lost. That is the greatest skill to have in my view. I’m still learning it. I’m not 100% flexible, but it’s a good skill to have and it keeps you grounded. Do you think having children has maybe helped you develop it? Most definitely. I went into parenthood with the same type A personality. I was in for a surprise. I planned when I was going to have children and what would be the space between them. Luckily for me, biology was on my side, for the most part. They are exactly two years apart. My oldest and the second born are two years minus one day apart. It doesn’t get any better than that. But I’ve had to adjust my life to the needs of my children much more intensely than I had initially anticipated. My children come first and I have no qualms about that decision. But managing parenthood and a career in international affairs can be a tall order. Now I have a third child, people often ask me: “How do you manage all your projects and three children at the same time?” The short answer is: “I just pick them up and go.” I remember going to an academic conference with a four-month-old baby. I flew from Nairobi to Indiana (USA), and then I flew to Europe to do some field research with the baby. At the time, she was young enough to be very flexible with my schedule. I really didn’t wonder “Is taking her along going to be prohibitively difficult?” I just did it. I suspect that had I spent too much time thinking about it, I would have talked myself out of it. But in the end it worked out fine. I carried baby and stroller across a couple of countries on trains. I took the same child to a few conferences a few months later and it became more challenging, but that I another lesson to be learned. It’s not until children get a little bit older that you realize that you have to start taking school into consideration. Sometimes my spouse and I can’t help but think, “We could simply live in a studio apartment in New York and then commute between New York and Nairobi.” But we quickly have to snap out of it. We have three young children. A studio apartment is definitely not big enough for my super energetic boy. And I can’t jet set whenever I want. Luckily, my husband knew exactly the kind of person I am when we got married. So there were no expectations of me taking all the caregiving responsibilities. He also travels a lot. He is in international development and education and we make it work. So the spontaneous jet setting days have been replaced with a careful choreography of moving parts consisting of deliberate travel scheduling, childcare providers, a strong support system, and my husband and I often crossing paths at the airport. And sometimes, one of us has to say: “No, I can’t go” and be ok with that. It’s definitely pushed us to be flexible in terms of our scheduling and in terms of how we are going to achieve our career and family goals. Sometimes I give a little, sometimes he gives a little. He is in Namibia at the moment because I’m doing a Fulbright in Namibia that required him to have a conversation with his work about the possibility of working remotely. I had never planned on having children growing up. As the oldest daughter of a family of five children, I did my share of diapering and disciplining. I had no desire to be a mother. With time, I changed my mind. I decided that I would have one and if we were both alive at the end of the first year, then that would mean that I was okay as a mom. Then I had two more. There are my pride and joy, but they know how to keep me on my toes. I remember once having to do a radio interview crouched on my bathroom floor to get five minutes without interruption. Raising children is also loving and nurturing completely different little humans with the hope that they each become the best individuals they can be. My children may be very close in age and raised the same way, but they each have their own personalities.. My oldest has a great sense of justice. When things are not fair, he lets you know and he is combative about it. He wants you to understand why life is not fair. I have the middle child who doesn’t yet know where she fits, so some days she wants to be friends and on other days she wants all out war with both the youngest and the oldest. But she is the most nurturing person that I know. The youngest is the strongest willed child I have ever seen. She has as much strength and determination as a toddler than it took me 35 years to develop. Having children to a certain extent helped me be flexible as a person, as a human being but also as a professional. You don’t plan on going out with a child and being thrown up as you enter a restaurant. But if it does happen, you have to improvise and figure out how to still look decent as you walk in. I think that these are good skills to develop.